FARMINGTON, ME (October 22, 2018)—A top childcare and teacher preparation facility in the state of Maine, the Sweatt-Winter Childcare and Education Center on the University of Maine at Farmington campus is having growing pains as Maine is experiencing a teacher shortage. 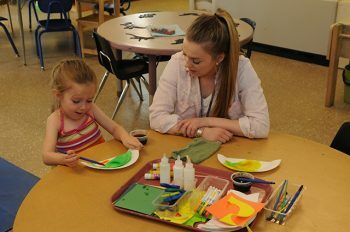 UMF Education majors gain real world classroom experience at on-campus Sweatt-Winter Childcare Center. In addition to providing familes with quality childcare, Sweatt-Winter serves as a research site for investigating new approaches to early childhood education and as a lab school for UMF education majors where best teaching practices are taught and demonstrated by onsite UMF faculty instructors. The Center recently received a $3,500 “Learning by Nature for ME” pilot grant from the Kennebec Valley Community Action Program to strengthen the ways the Center’s outdoor environment supports children’s developmentally appropriate play/learning needs that build on a child’s sense of wonder about nature. “KVCAP/Educare Central Maine values our longstanding partnership with the UMF Early Childhood program. We are excited about this unique opportunity with the Learning by Nature for ME initiative to reinforce our support of UMF and Sweatt-Winter and their commitment to the outdoors as a learning environment,” said Tracye Fortin, KVCAP assistant director. The Sweatt-Winter program has provided a top quality, full-time childcare and education program for children in Franklin County and the surrounding areas for more than 30 years. “There is often a waiting list for our childcare programs, which have double the impact on the community serving both families with children and UMF education students,” said Julie Farmer, director of Sweatt-Winter children’s programs. If Question 4 on the upcoming bond on November 6 passes, funds will be available to expand the capacity of the Sweatt-Winter Center providing innovative spaces for additional childcare opportunities for Maine families and enhanced pre-professional training for pre-service teachers. The University of Maine System is increasingly pursuing partnerships to tackle Maine’s top workforce challenges. Last month, Maine’s public universities announced a plan to double nursing enrollment to reverse a state shortage and in November voters will be asked to approve Question 4, a $49 million infrastructure bond that will expands education and training across the System to produce more in-demand healthcare, teaching and STEM professionals. Photo Caption: UMF Education major gains real world classroom experience at on-campus Sweatt-Winter Childcare Center.